We’ve come a long way since cooking over a fire in a cave. There are gas stoves, electric stoves, sous vide, grills, and a variety of other methods with which to cook food. It’s all up to our taste buds and wallets of how we want to go about things. Those of us with adventurous tastebuds need a myriad of kitchen accessories to make sure we hit the right spot every time we put a meal together. If pizza is one of your favorite foods, and there’s no reason it shouldn’t be with how versatile it is, then you likely want a way to make your pizza without having to rely on any regular ole oven. 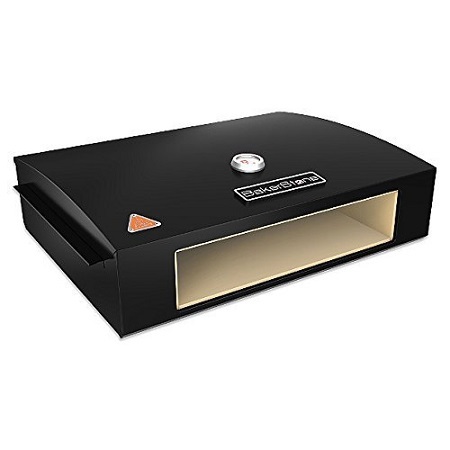 This BakerStone Pizza Oven is an oven box meant specifically for baking the perfect pizza. It can, of course, cook meats, vegetables, fish, and more, but if we’re being honest pizza is the only part of the menu we care about. This converts most 3 burner and larger gas grills as well as large charcoal grills into a gourmet pizza cookery. This is a stone baking chamber combined with an enameled steel housing which creates an air flow system that will give you improved convective, conductive, and radiant heat in and around the chamber. This is not cheap at around $113, but hey, pizza from a stone oven whenever you want makes life worth living.